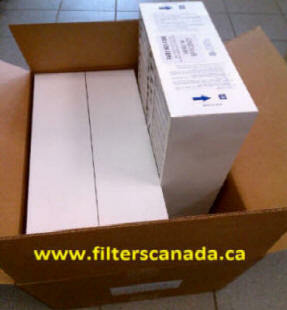 who wish to save .Look below for all Lennox filter replacements. Some airborne contaminants are uninvited like pollen, mold, fungi, bacteria, viruses, dust, mites or even radon gas. While others are self-contributed like tobacco, wood or cooking smoke, combustion by-products, insecticides, pet dander, toxins emitted from air freshners, carpets, carpet deoderizers, dry-cleaned clothing, glues, household cleaners, paints, varnishes, personal care products, pressboard furniture and cabinets, and lots more. Considering you spend 90% of your time indoors, breathing in 16,000 quarts of air each day, which may be 20-70 times more polluted than outdoor air...you and your family are breathing a chemical stew. retained deep in the lungs, which may result in respiratory and other health problems after years of repeated exposure. airborne pollutants 0.3 micron and larger. • Great for allergy, asthma and respiratory sufferers. off-gassed from new carpets, construction materials, paints and more. • Indoor Air Quality will be fresher and healthier, year-round. Removes irritating airborne allergens. A must for allergy or asthma sufferers. • Housekeeping time and redecorating costs will be significantly reduced. • Protects and prolongs operating efficiency of heating and cooling equipment. • Indoor Air Quality will be fresher and more comfortable, year-round. • Removes irritating airborne allergens. A must for allergy or asthma sufferers. • Protects furnishings and decor from staining dirt particles. • Prolongs the life of your heating and cooling equipment.